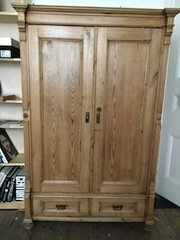 A tall standing solid pine double wardrobe on ball feet, having two small drawers to the bottom. 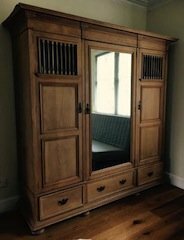 A large solid wood tripled wardrobe on ball feet, the central door inlaid with a full length mirror. 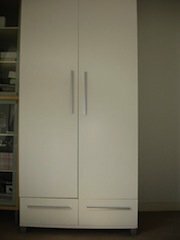 A tall standing white wood double wardrobe on chrome feet, having two drawers to the bottom. 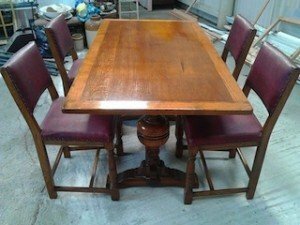 A solid oak vintage rectangular dining table, together with four high back dining chairs, upholstered to the seats and backrests in ox blood red leather. 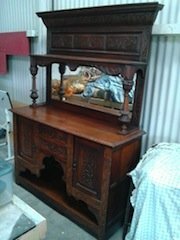 An antique heavily carved solid oak wall dresser, inlaid to the back with a bevelled mirror. 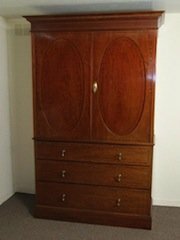 A tall standing Edwardian solid wood dresser, having a double wardrobe above three large drawers. 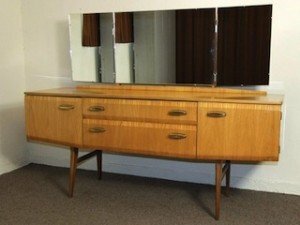 A 1970’s retro pale walnut dressing table, having a tri folding removable mirror above two cupboards and two drawers. 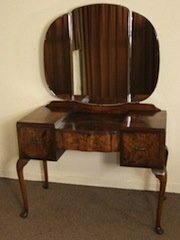 A vintage art deco Burr walnut Queen Anne style dressing table, having a large tri folding mirror above two large drawers. 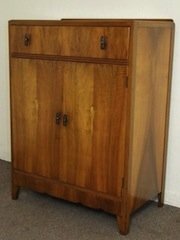 A vintage art deco golden walnut tallboy cabinet chest, having a large drawer above a double cupboard. 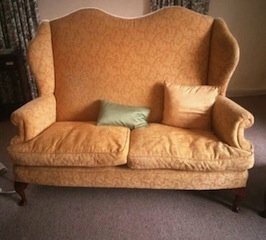 A vintage wing back two seater sofa on mahogany legs, upholstered in floral patterned orange fabric. 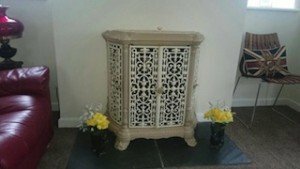 A hand painted cream and stone coloured cast iron log burner in the shabby chic style. 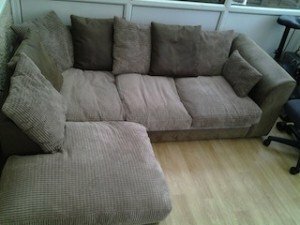 A four seater low back left hand corner sofa, upholstered in grey suede and corded velour. 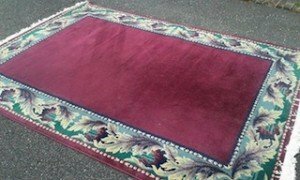 A large vintage velour fringed area rug, having a colourful leaf patterned border against a red ground. 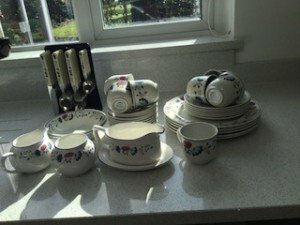 A collection of floral patterned kitchen accessories, to include a cutlery set and stand, a milk jug, a sugar bowl, a gravy jug, teacups etc. 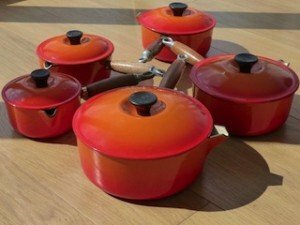 A set of five wood handled Le Creuset volcanic orange enamelled lidded saucepans. 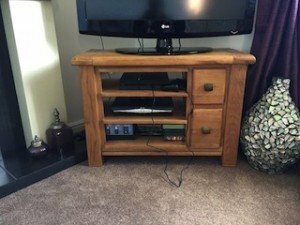 A solid oak two drawer television unit, together with a 42 inch LG black flat screen television. 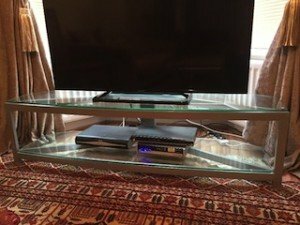 A glass and chrome large one shelf television stand, together with a black 55 inch Panasonic flat screen television. 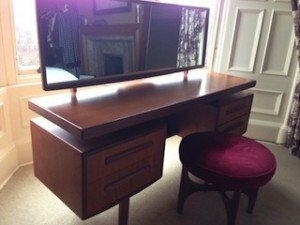 A vintage G plan fresco four drawer dressing table, together with a matching red velour circular stool. 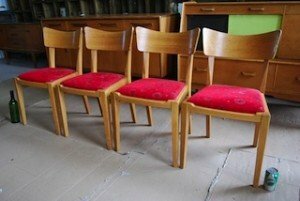 A set of four 1950’s solid oak curved back dining chairs, upholstered to the seats in patterned red fabric. 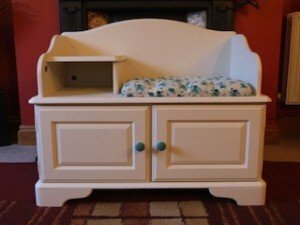 A hand painted white solid wood telephone table, upholstered to the seat in blue and white floral patterned fabric, having a small shelf above a double cupboard.